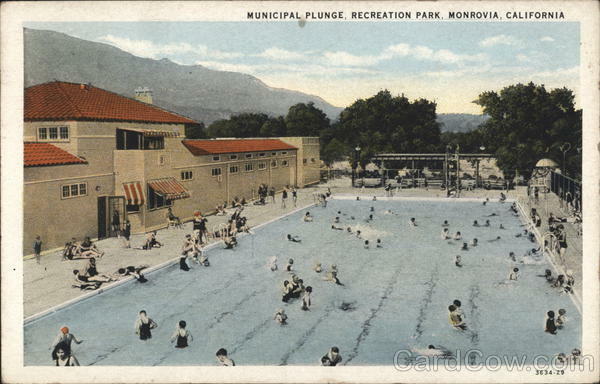 In the early days of Monrovia, when open land was abundant, there was no need for designated park area. As development continued and the central city became more densely populated, Monrovians set aside land for specific park use. The drive to establish Recreation Park, where the Museum is located, began in 1921 and culminated three years later in a successful bond election which made possible the purchase of the present twenty-two-acre park. With the new park came new ideas. Why not construct a municipal swimming pool in the park? Earlier Monrovians had enjoyed the equivalent of the old swimming hole – the reservoirs which irrigated the foothill orange groves. The idea of a municipal plunge was well received, and in 1925, the new plunge building and pool were constructed with the pool located just outside the south windows of the foyer. Constructed in the popular Spanish Colonial Revival style, the new building featured a two-story central portion with flanking single-story wings. The East wing of the building was the boy’s showers and lockers and the West wing was for the girls. Opening day saw an attendance of over 700 people. The Plunge had stocked only 350 swim suits, so they washed each suit as people returned them so that others could enter the pool. A pool man lived year-round in the two-bedroom apartment that is located above the foyer. The apartment is now used as the Museum offices and will soon serve as a Research Center for the public. The garage located on the east side of the Museum was built when the pool man bought his first car. The pool held nearly a quarter of a million gallons of water and had no filters like today’s pools so the water was kept clean solely by the use of chemicals and hand-cleaning. It is believed that the pool was filled in the Spring, just before school let out, by use of a fire hydrant. In the Fall, it was emptied by dropping a pump into the deep end and pumping the water out into the park. The Monrovia Municipal plunge served the community for over 50 years. As time went by, the pool needed major structural renovation due to cracking from earthquakes and age. It was finally decided to abandon the old pool in favor of a reconstructed facility at Monrovia High School. The pool was closed in 1983. There are display cases in the Lobby that show documents, pictures, and other items from the pool’s history. In 2004, the City of Monrovia designated the building as Historic Landmark No. 67.